Visitors may get the feeling that the house reminds them of somewhere familiar. It is frequently used as a film set and was featured in the films "Notting Hill" and "Mansfield Park". Judge William Murray, 1st Earl of Mansfield, commissioned Robert Adam to create a grand stately home for him. It took from 1764 until 1769 for the remodeling of the earlier brick house to be transformed into this majestic villa. However, the house lacks the feel of a much-loved family home, instead presenting itself as a grand and lavishly appointed art gallery. 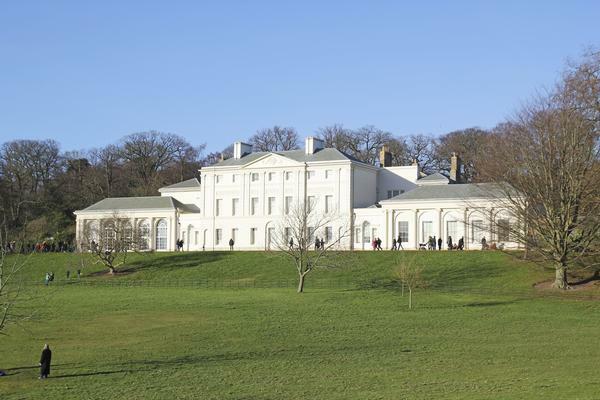 The fine artworks at Kenwood House include paintings by some of the great master artists of their day such as Vermeer, Rembrandt, Reynolds, Gainsborough and Turner. As well as permanent collections there are regularly changing exhibits. The upper floor has 41 paintings on display which are mainly family portraits passed down through the Berkshire and Suffolk families since 1580. The Suffolk collection of rare portraits give a valuable insight into the extravagant costumes of the Stuart and Elizabethan periods with full length portraits of noblemen and ladies. The richly decorated library is particularly worth exploring with its beautifully painted frieze and grand colonnade. There are some original Adam furnishings which are also on display in this period stately home, along with furnishings purchased from the Palace of Scone, the Earl of Mansfield's Scottish home. These items include four Chinese dining chairs in Chippendale style, silverware and a family portrait painted by Sir Peter Lely. The dining room has been restored to its former glory of the 1820s with rich red velvet curtains and plush upholstery. The two neoclassical pedestals and pair of sideboards were originally made especially for the room and now provide the perfect setting for the two masterpieces - Rembrandt's acclaimed self portrait and Vermeer's "Guitar Player". The music room, which was originally created for the Countess of Mansfield, now complements the collection of paintings of Georgian ladies and is beautifully restored with green silk curtains to match the upholstered seating. In 1922 Kenwood House was put up for sale and to prevent it falling into the hands of developers it was bought by 1st Earl of Iveagh, a member of the wealthy Guinness family. Shortly afterwards he bequeathed it to the nation along with his famous art collection. The house is now in the care of English Heritage. The artworks now complement the sumptuous interiors and rich décor of this London stately home. 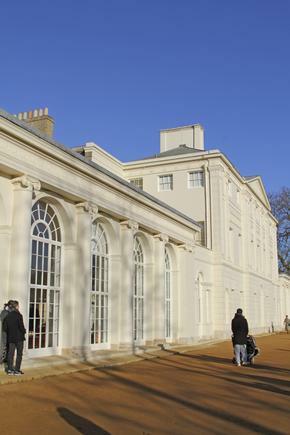 Like many London museums, entrance to Kenwood House and gardens is free. 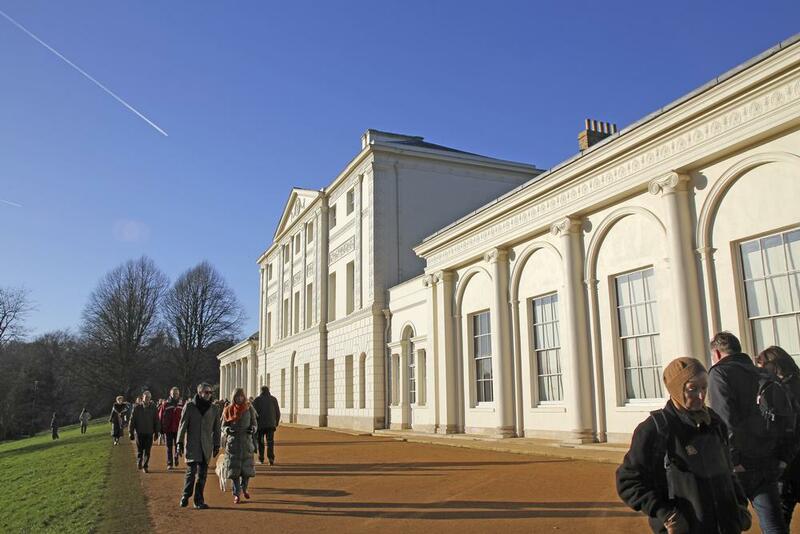 The gardens surrounding Kenwood House were created by Humphrey Repton in an English park style. It is an interesting twist that Repton was acknowledged as artfully creating man-made gardens which looked far more like a natural landscape than the real thing! The beautiful landscaping around Kenwood House is one of the best visitor attractions in this area of London and offers plenty of public space for walking, jogging, cycling, dog-walking and sports. Tfl 210 railway Finsbury Park - Golders Green. Gospel Oak or Hampstead Heath. Archway and Golders Green, then 210 bus.